Twenty-five years later, and the Coen brothers’ Barton Fink meaning is still being debated. Is the Hotel Earle actually hell? Is this just a case of two filmmakers writing about their experiences in Hollywood? Does the threat of Red Scare loom over its every scene? Viewers may never know for certain, but it is fun to theorize and discuss the film at length; it’s a deep enough film that is open to multiple interpretations that rewards with every rewatch. The Coen brothers’ tale of a playwright in 1941 going west to write a wrestling picture for Capitol Pictures has long stayed in the minds of the audiences that saw it. Though it’s not typically one of the go-to films people mention when discussing the Coens’ filmography, it does contain great dialogue; exceptional performances from John Turturro, John Goodman, Michael Lerner, and Judy Davis; and a fine blend of disparate moods and genres within its deceptively simple story. With its densely layered references to actual historic figures and events, along with all of the metaphorical stuff about insanity and hell, it’s no wonder that the film has been unpacked by cinephiles since it came out. Coenesque offers up this viewer’s guide to the film which highlights certain themes and unanswered questions. Mike D’Angelo delved into the way the film works by tackling it for a Scenic Routes post on this site, looking at the moment Fink checks in to the Hotel Earle. And actor Michael Lerner had some insight into the making of the film in his Random Roles with Jonathan Peltz, talking about his Oscar-nominated performance in the film, what inspired it, and what it was like to work with the Coens. As for what the filmmaking duo have to say about it, there’s an interview with the brothers from January 14, 1992 for Film 92. In it, the Coens discuss the origin of Barton Fink—how it came about amidst difficulties in writing Miller’s Crossing—as well as what drove the story and the script. 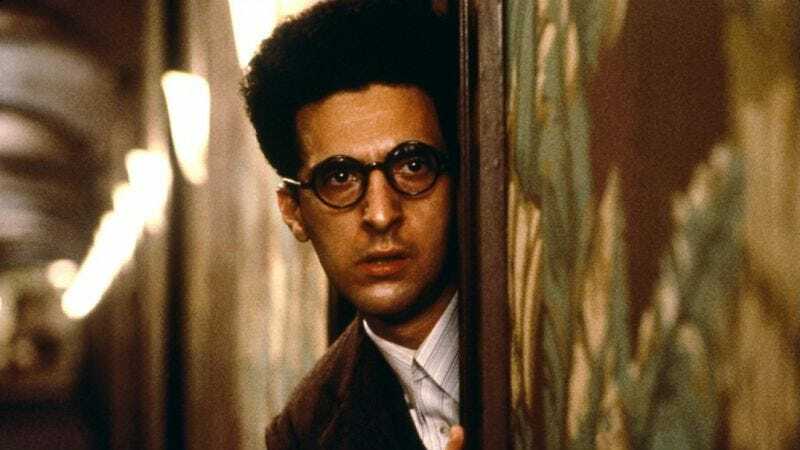 Barton Fink has survived and even picked up fans over the past 25 years because it is both plain spoken but also highly allegorical, much like the supposed charm of the titular character’s writing. Its bizarre blend of comedy, drama, thriller, and nightmarish surrealism has made it a unique piece of filmmaking that many people return to, even if they don’t quite know why. The film is hilarious one moment, and then shockingly depressing the next, and it’s all handled with the assured aplomb of two master filmmakers.